Last year when I thought about doing this food holiday year, I was adamant I plan things ahead. I am a fly by the seat of my pants person through and through. Such as today's holiday. 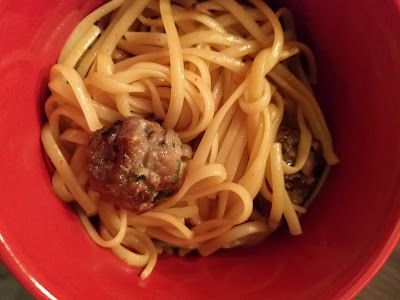 It's national spaghetti day today, and I wanted to make spaghetti and meatballs. But I wanted to make Jolibee style spaghetti and make meatballs with the same filling as lumpia shanghai. Perfect spin, right? But when I checked the kitchen, I had none of the ingredients to make any of this. Not even the spaghetti. Pretty hilarious, considering the fridge is packed with a ton of stuff. Same goes with the pantry. So my compromise was sesame noodles and stir fried wonton meatballs. The recipe for the noodles can be found on Rasa Malaysia. The meatballs are from Nom Nom Paleo.